I find it always good for me to read Julia. I love that you created this list of gems, Melanie. 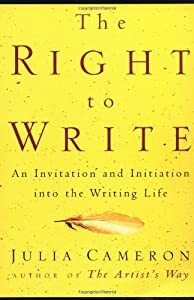 Not in the Goodreads group, but I did read some in The Right to Write just this week. Thanks for stopping by and commenting Sabra 🙂 Always nice to see a fellow MNINBer on Writerly Goodness. I love this list, Mel! You’ve taken much better notes than I have. Mine are all scribbled in the margin. I share your passion for Julia’s approach. It has really affected me. I read with whatever’s at hand. Just so happened I was reading at work (on break, of course), and the highlighter was right there! So I plucked out the bits that really seemed to summarize the section for me.